Not so long ago, there was only one real option to straighten teeth: metal braces. If you wanted that perfect smile, your teeth had to hide under a layer corrective metal for a while. But times have changed and so have your orthodontic options. Today, you can subtly straighten your smile and avoid a brace-y grin, thanks to the following 3 alternatives to braces. With a clear aligner, no one will notice your braces – all they’ll see is your smile. Clear aligners are a great choice for both teens and adults, especially those who enjoy rough-and-tumble sports. They’re relatively new orthodontic treatments, usually involving a series of 18-30 custom-made, clear plastic aligners to guide teeth into proper position. The aligners are removable and are replaced every 2 weeks. The nearly-invisible look of clear aligners has made them extremely popular. But beyond their aesthetic appeal, clear aligners have other benefits. Since they’re removable, they don’t interfere with eating or speaking. Plus, they’re less likely than traditional-style braces to irritate the soft tissue surrounding teeth. They can even be used as a bite guard to prevent damage caused by bruxism, or tooth grinding. Clear aligners aren’t the solution for everyone, however. They work best for patients with relatively mild cases of crooked or protruding teeth, gaps, or over/underbites. More complex orthodontic issues, like rotating or moving teeth vertically, are more effectively treated with traditional braces. Also, if you don’t have the discipline to wear an alignment tray for up to 22 hours a day, you should opt for a different kind of treatment. 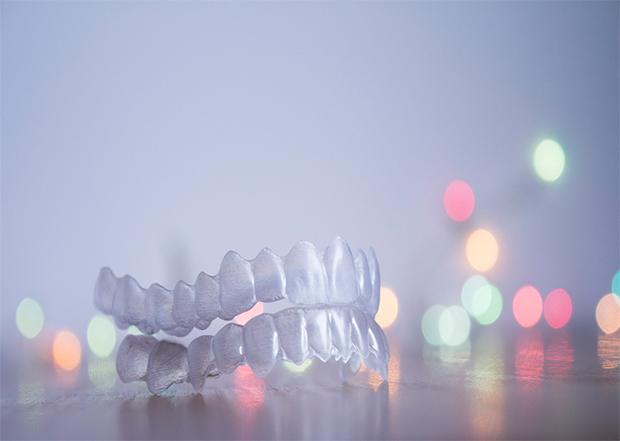 Learn more about the pros and cons of clear aligners and traditional braces in our recent blog. Another approach to perfecting a smile without traditional braces uses cosmetic veneers. Veneers are thin laminates that bond directly to the surface of a tooth. They’re often used to alter the color of your teeth, close a space, “even out” mildly misaligned teeth, or repair a cracked tooth. The obvious big “pluses” of cosmetic ceramic veneers is that you can avoid wearing braces altogether and achieve your desired smile in a relatively short amount of time. But there are some notable drawbacks. Veneers won’t change the actual position of your teeth; moderate to severe malocclusion requires repositioning, which almost always mandates braces. And unlike braces, the effect you’ll get with veneers probably won’t last a lifetime – veneers typically last 5-10 years, so you’ll have replacement costs in addition to the initial cost. Only you and your dentist can decide which of the 3 alternatives to braces is best for you. This entry was posted in Orthodontics and tagged Aligners, Braces, Metal Braces, Non-traditional Braces, Orthodontics. Bookmark the permalink. Follow any comments here with the RSS feed for this post. Both comments and trackbacks are currently closed.